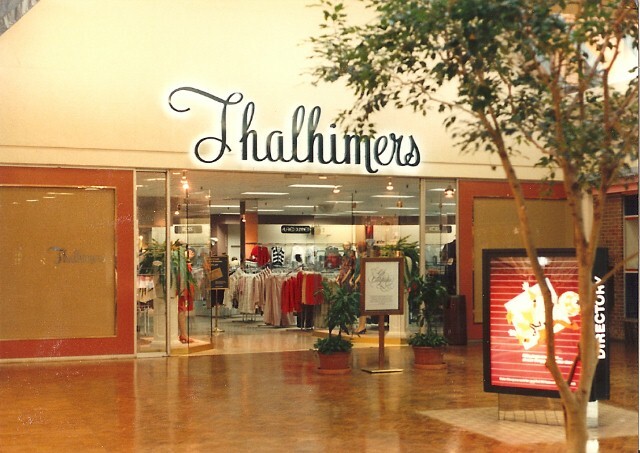 A casualty of May’s 1991 announcement was the closing of the Walnut Mall Thalhimers in Petersburg, Virginia. Located about a half hour south of Richmond, this mall opened in 1966. Billed as “The Shopping Showplace” it contained a 67,000 square foot Thalhimers along with a large Penney’s. In addition a small local store, Rosenstock’s, was located there as well. Petersburg has been trying to beat the odds since the Civil War, and it lost once again when the South Park Mall opened in neighboring Colonial Heights in 1989. Stores bolted. Penney’s bolted. Stores near the mall bolted. Thalhimers, for some reason, tried operating its Walnut Mall store along with a new store at South Park, albeit with reduced hours and smaller departments. With the May Co. now making decisions, it was quickly announced in March 1991 that the underperforming Thalhimers would close in May. Few stores were left by then. Peoples Drug had already announced its closure. Mall owners along with city officials thought about turning the mall into an outlet mall or even offices. At one point a library was planned. But for over 15 years the Walnut Mall has sat there. If you’re ever on I-95 and driving through Petersburg, VA take a side trip onto Crater Road. You will see a true Shopping Showplace awaiting any type of fate. These photos were taken in May 1991. By then even Thalhimers display windowed had been bricked over as the area was rapidly deteriorating. Yow… this satellite photo seems to bear out the story–while this 1960s-vintage mall seems pretty tiny (about 300,000 square feet or so), it’s looking pretty forlorn and lonely nowadays. Deadmalls has some more details if you care to check it out, but the overall story is like one we’ve heard many times before: a smaller, more outdated (but also perhaps a bit more charming) mall was killed by a larger, more formidable competitor a few miles away. Stories like these are always a bit tragic to me, however, because here in the Northeast it’s pretty rare for a mall to just sit, untouched, for such a long time. One thing to add about the recent satellite photo of Walnut Mall. First, notice the absence of cars in the parking lot. Across the street notice the center with again the absence of cars. It was a former Kmart, which was closed in the early 90s during the first round of mass closings. Before Kmart, I believe it was a Grants. Next to the closed Kmart was a Super Fresh Sav-A-Center. Again closed. Towards the upper part of the picture you will see some dirt across from the mall. That was an odd very short but not tiny Sears. It became a clearance center when everyone bolted in 1989. It stayed open for a little while. It also had a strange key making kiosk in the parking lot, kind of like a Fotomat. The whole complex seems to be gone. At the very top of the picture, which is basically unseen, it a former large shopping center that up until the mid 90s had of all things a Bradlees. It was one of 2 Bradlees in the state of Virginia that was forced to stay open for legal reasons after the chain pulled out of the area in the late 80s. (The other was at the Tower Mall in Portsmouth, VA. A wonderfully fascinating dead mall.) Both Bradlees stores were former JM Fields stores. The center also had central Virginia’s last Woolworth’s store, closing with the rest of the country’s in 1997. Next to that center was a closed down Safeway with a round roof. Crater Road in the early to mid 90s was a Labelscar heaven. It still kind of is. When I lived in Richmond I would occasionally make a pilgrimage to Bradlees for a fix. It was poorly stocked but hell, it was Bradlees. I’m sorry to see Sears gone, but not shocked. The Walnut Mall area just might be America’s best kept retail graveyard. Perhaps they could just add it to the area’s long list of Civil War battlefields. I like the Thalhimers frontage outside, and the interior entry with its old signage. Very dated looking, but cool at the same time. Love the Thalhimer’s sign! I’ve never seen one, before. I remember my Emporium Capwell credit card said it was also good at Thalhimer’s (also Weinstocks, Broadway, and Broadway Southwest). This particular Thalhimers location was always a mystery to me. I remember seeing it in the store listings back in the day, but never visited the store, or even passed anywhere near it. These pictures rock! I would probably have never seen them anywhere but here. FYI, Walnut Mall was leveled last year. A new center is being built on the site that will have a 35,000 s.f. Food Lion and 11 smaller stores. So it’s not “untouched” any more. I’d say it’s had the ultimate “touch” done to it. Thalhimer’s had some locations in what are now either completely leveled malls (Walnut Mall, Azalea Mall in Richmond), retail areas completely redeveloped into offices and light industry (Westmoreland Center in Richmond) and what are now fairly dodgy areas (Circle Shopping Center in RIchmond). Most of the downtown Richmond Thalhimers was torn down a couple of years ago. I’m glad (in principle) to hear an update on the Walnut Mall site. It was a sight. Actually Thalhimers began their branch locations in Richmond by acquiring the McCargo-Baldwin store in 1959. This location in Richmond’s “second downtown” in Manchester lasted for just a couple of years until its move to the Circle Shopping Center. (The deal with a location at the Southside Plaza, where Miller & Rhoads and Penney’s were located, fell through. Southside Plaza was just across the street from the Circle Shopping Center. Their next branch was a small “Young Virginian’s Shop” at the River Roads Shopping Center. This store eventually became Richmond’s Montaldo’s suburban branch. The Westmoreland store was actually part of the Thalhimer warehouse. It opened, with only 20,000 square feet, in 1962. Over the years it grew to over 100,000 square feet, all on one floor. Azalea followed in 1963, according to company records. Cloverleaf & Regency followed in the 70s. Cloverleaf, a strange dead mall, opened with one floor but added another after a couple of years. Westmoreland closed in 1993, Cloverleaf in 2003. However throughout the 60s into the 70s Thalhimers operated 3 auto service centers in the Richmond area. As a separate note, I was the final shopper at the downtown Richmond Thalhimers in January 1992. Even made the paper. That’s so cool! Hope you kept the article! I drove by the Walnut Mall site on May 18th, and construction is proceeding apace on the new Food Lion, which will probably have the largest parking lot of any Food Lion ever – although most of the parking will have weeds sprouting up through cracks. Hopefully the developers will do something, unless they want to create a new shopping center with an instant dead look. One thing I did notice is that there are a lot of simularities between the Walnut Mall area in Petersburg and the Southside Plaza/Belt Boulevard area in RIchmond. The key thing is that development is hemmed in by railroad tracks in both instances. Belt Boulevard used to be almost entirely encircled by tracks, though some have since been abandonded. Once these areas were developed for retail, there wasn’t anywhere for new development to occur, so the new stuff moved further out where the available space was somewhat open ended. Cool pictures! I live in Petersburg. The new Food Lion opened a-month-and-a-half ago at the new Walnut Hill Market shopping center where Walnut Mall once stood. The Kmart/SuperFresh shopping center on the corner of South Crater and Morton is now home to the new Good Shepherd Baptist Church, which moved from its Virginia Avenue location last year. Walnut Hill Plaza, the “former large shopping center” on the southeast corner of E. South Boulevard and South Crater, still stands and is now home to stores like local furniture store Butterworth’s (where Bradlees used to be), Maxway (where Woolworth’s used to be), CitiTrends, Prime Time Rentals and Save-A-Lot (which opened last year). Sears Outlet, what Michael was talking about, was demolished in the late ’90s. Oh man, that picture brings back so many memories. I live in Prince George, but through the years I’ve watched all the changes around that certain spot. The month that photo was taken, I remember my family and I being at Thalhimer’s the last several weeks before it closed (I was just turning 9 years old then), there were clothes all over the floor. I’m happy to see Petersburg coming back alive again! PS. The last time I went to Cloverleaf Mall since they closed, I was SPOOKED seeing the mall compared when my dad used to take me up there in the mid 1990’s. Many thanks to Labelscar and Micheal Lisicky for posting the info & pics on the Walnut Mall Thalheimer’s . My mom went to that store and that mall a fair amount when I was a kid. I remember getting a Snoopy pencil box from Thalheimer’s and M&Ms by the pound and Callard & Bowser’s Butterscotch from Thalheimer’s candy counter toward the center of the store. Check it out before someone updates those photos out of existence. your right about that not just petersburg but must of the richmond market would be ground zero for lablescar heaven, due to the fact that there are so many dead & dying malls in the area, but goddess i loved going to walnut mall only for two reasons (1) the only alladdin’s castle in the area (2) waldenbooks ‘yep you can easly guess i’m just a bookslut about places like that. Good to see some interest in Walnut Mall. I’m originally from Petersburg/Hopewell and have many fond memories of lazy summer afternoons in the mall. I’m also delighted so see another poster comment on Aladdin’s Castle – the only arcade in the area. It was located in a former bridal gown shop next to JC Penny’s. It was unique because you had to climb a set of stairs to enter the arcade. I spent many a quarter there back in the hey day of the mid 80s. People’s Drug also had some arcade games (Defender, Ms. Pac Man, Tempest) but the atmosphere had nothing on Aladdin’s Castle. 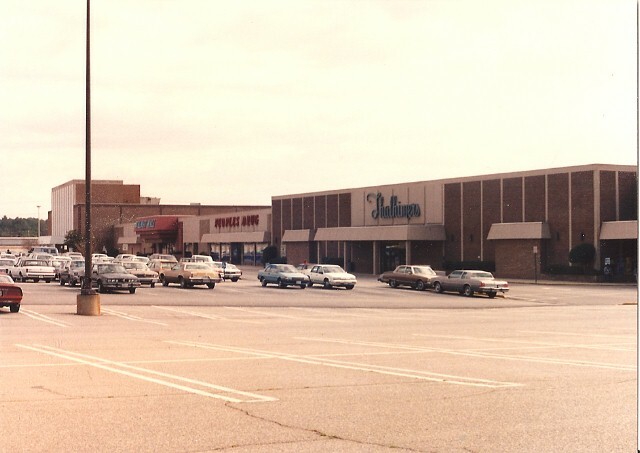 Walnut Mall was essentially killed by Southpark Mall in Colonial Heights which opened in 1989. Anyways, I’m glad a part of my childhood is also shared by others. well at least there’s another person who liked going to aladdin’s castle but the only problem during that time i was in a wheelchair and well it was imposible to get up there . A new CVS/pharmacy (on the southwest corner of Walnut Boulevard and South Crater Road) will be open in mid-July. Another mall I have little memory of besides an empty shell. I used to do some work in the area for Virginia Forklift and passed by the old mall occasionally. Never had a reason to stop there and my family would go to Southpark if we wanted a change from the Richmond area malls. I enjoyed seeing the picture of Thalhimers. I have vivid memories as a child in the 1970’s and early ’80s going to Walnut Mall. Petersburg was the ‘it’ place when I was growing up. My grandmother would even take us from Hopewell/PG on the bus to the Woolworth’s store across from the Mall. I too remember the old JM Fields store, then Bradlees, who until it was forced to stay open was a decent store. The Sears next door was good too. Then we had the Walnut Mall Theaters (2 movie rooms) right there too. I even remember going to Cloverleaf Mall. That was big time for us then. About two years ago I had a chance to go to Cloverleaf Mall and the old Thalhimers/Hecht’s building for a flu shot clinic. It was so strange walking around a basically empty store and seeing all the mirrors over the escalator and the bright orange carpeting. Of course during that mall’s heyday Chesterfield Towns Center was barely anything. In looking up some history on Walnut Hill Plaza in Petersburg, Va., I was happy to run across your blog concerning the old Walnut Mall. I spent many, many hours as a teenager doing “the mall walk” with my girlfriends. My grandmother worked in the hat store there and when I started college in 1976 at Richard Bland, she got me a part-time job at Morton’s Jewelers. I also was given a bridal shower at the restaurant that opened up there in the early ’80’s, called Country Folks. Walnut Mall was a pretty popular place back then. It’s pretty cool seeing the pictures of my old stomping grounds. My parents still live nearby and it’s bittersweet to see all the changes. Thanks for the trip down memory lane! Walnut Mall was a very popular place in the 1970s. I remember there was a large family restaurant inside there also, one of those large seafood restaurants with huge nets decorating the place. I also remember going to Walnut Mall as a kid one night in the early or mid 1970s when they erected stocked fishing ‘ponds’ inside, on the main hallway! (They were more like portable swimming pools with fish in them). I think my dad paid like $0.50 or $1.00 for a ticket so I could drop a line there. I didn’t catch any of ’em — they weren’t biting! @Larry Lanberg, WOW! I thought I was the only person that remembered that! That was a great memory, too! I also remember Spencers, and saving baby sitting money to buy the latest 45’s! I also remember the arts and craft shows in the mall. Anyone remember the lunch counters at JCPenny and also at Peoples Drug store? I so had fun at that mall. I did alot of clothes shopping at a store that was beside Peoples, but for the life of me, I can’t remember the name of it. Oh, and how could I forget Jeans Shack? WOW! And then there were the fun places, the hang outs. Joes place, Skateland, Walnut Mall Theater, Duffys Pizza. Oh how I miss all of that! SIGH! @Larry Lanberg, The restaurant was the Family Fish House. oh and about the credit cards i’d had a robinsons-may card & i was able to use it at hecht’s three times before they became macy’s. I remember Aladdin’s castle. You had to turn left and walk down and it was on the right just before JCpennys. It had the spiral staircase. I also remember Kaybee Toys. Thats where I got my first Nintendo Entertainment System. You could walkthrough Felts Drug store and enter the mall. I remember Sears across the street, with Kmart and there was a bradlees a little further down and a Rose also. The 80s and early 90s were the best! Looking at these pics and reading others comments is like stepping into a time capsule. I should asky my aunt who takes so many pictures if she has any pictures of the mall when it was booming. If she does I will post. The pictures of walnut mall brought back so many memories. I can close my eyes and picture stores like Thalhimers,Penneys, Aladdin castle Garys, and who could forget the dark Family Fish House where I ate a many piece of fish. I will never forget Walnut Mall and wish it was still around, may we never forget the areas Shopping Show Place. MY NAME IS CJ , IM 18, AND I LIVE RIGHT DOWN THE STREET FROM THE OLD WALNUT MALL WHICH IS NOW A BRAND NEW FOOD LION WHICH LOOKS VERY NICE. I CAN SEE IT FROM MY FRONT YARD.I ALWAYS WONDERED WHAT TYPES OF STORES THEY USE TO HAVE IN THAT MALL.BEFORE THEY BUILT THEY FOOD LION, I ALWAYS SAID THAT SOMEONE SHOULD DO SOMETHING WITH THE OLD BUILDING INSTEAD OF LETTING IT GO TO WASTE.NOW I BUY GROCERIES THERE ALL THE TIME.ITS WEIRD BECAUSE FOOD LION USE TO BE IN ANOTHER WORN DOWN SHOPPING CENTER A LITTLE WAYS UP THE ROAD UNTIL THEY BOUGHT THE NEW SPACE. BY THE WAY , THAT SHOPPING CENTER ACROSS THE STREET A LITTLE DOWN THE ROAD FROM THE OLD MALL NOW HAS A SAVE-A-LOT GROCERY STORE, MAXWAY,BUTTERWORTHS FURNITURE STORE, CITITRENDS , AND A FEW OTHER PLACES AND ITS ALSO BEING REMODELED. I can almost smell the creme filled donuts! They had the best bakery, and put them in black and white checkered bags that were lined with wax. I remember this mall opening when I was only a kid of 5, and the palm trees and fountain inside. I liked going to the Bressler’s 33 Flavors Ice Cream Parlor. Even the People’s Drug had a lunch counter. When I grew up I worked at the JC Penney’s. I still can’t believe the mall is gone, torn down about 2 years ago. I wonder what happened to the poor palm trees. Now, the Southpark Mall is starting to decline. I guess it’s only a matter of time for all malls, but I don’t know why.Anyway, thanks for the memories. I only have one picture, of the outside of the People’s from the Firestone tire shop. I think you can see the Rucker’s too. It was taken soon after the mall opened. If you’re interested I could post it. Please post that pic, I grew up shopping at that mall with mom. Thank you so much. I’ve enjoyed reading this page; stumbling on it after doing a search on Petersburg, my boyhood hometown. Walnut Mall, and its counterpart Walnut Hill Plaza, were truly THE places to shop (in the Tri-Cities) in their heyday. My first real job was at Shoe Show, in Walnut Hill Plaza, during the early 80’s. The area then was still thriving, but starting to show some decline. Does anybody remember Miller & Rhoads, in the Plaza? Thalhimers, and Miller & Rhoads were the BIG department stores from Richmond; sort of like the Macys & Gimbals of the area. Both were great stores. Petersburg was served by the stores at “The Mall” & “The Plaza”. Good memories. I was glad to see somebody finally mention the Family Fish House. It was a dark place, but (from what I can remember) had good food. Also, does anybody remember when the Walnut Mall Theatre was just one big screen, before they chopped it into two? I think it was the biggest screen in the area, and I can remember seeing Star Wars there, in 1977; paying and exorbitant $2.50 a ticket! @TS, I remember watching Star Wars in that theater too! I was eleven in ’77. “Hanging Out” in the mall was just a way to spend time back then. My father forced the family to move in ’83 to southeast Alabama and I’ve been here ever since. I still miss the snowy but tolerable winter seasons. I worked at Thalheimer’s back in 1981-1983 while I went to Petersburg High School, Ms. A was my supervisior I worked in the jewelery department, hosey, gift wrap, swtich board and the cash cage. Loved working there I also wnet to work at the warehouse of Thalheimer’s in Richmond at Westmorlyns. Any one remember the Levis Shack??? I worked at JC Penney in 2002-2005 in Fine Jewerly. I loved going to the mall and to the movies they had midnight movies too. We even could smoke at the theaters. Does anyone know what use to be in the large former rental store that beauty world at Walnut Hill Plaza now occupies (next door to Cititrends)? Re: Todd – As all shopping centers evolve over the years; stores come and go, but I can tell you some of what was there in the 1980’s, at least the larger stores. (Can’t remember all the smaller businesses.) Starting on the northwestern end, closest to Crater Rd was Miller and Rhoads. There was a Pantry Pride grocery store located about midway in that section of the Plaza. I think that’s close to the space in question. Closer to the ‘middle’ of the Plaza was a Rite Aid Pharmacy, then Shoe Show. There was (I guess still is) a ‘gap’ or access to the rear parking area, and then Woolworth’s. At the southern end was Bradlees, which, originally in that spot, was J.M. Fields. Between Woolworth’s and Bradlees was a Hallmark store, a Pic n Pay (? ), and a local men’s store (Adolph’s? ), not necessarily in that order . I’m sure there were a few smaller stores / businesses that I’m missing, and I’ve offered way more info than requested. I’m just enjoying this trip down ‘retail memory lane’! Yes great memories, I grew up in the burg in the 60’s -70’s Adolphs was the mens clothing store in the plaza while the mall had Taylor’s formal wear, rented my prom tux there in 1974. I remember when the Walnut Mall opened, Troy Donohue made an appearance there for the Grand Opening. Other stores not mentioned include Standard-James Shoes, Wices (ladies clothes) and a record store. At the Plaza across the street WSSV Radio had a permanent kiosk in the parking lot where they broadcast every day when school let out. I have fond memories of that mall as a kid in the 1970s through the 80’s before Southpark Mall opened in 1989. I went to many movies at the theater next to it, remember the billboards out front, the Walden books, the Halloween stuff at People’s Drugs, comics, the Gary’s record shop, toys at Penny’s, the dimly-lit fish restaurant, bakery at Thalhimers, etc, etc and eating down the road at King’s BBQ. I’m 41 now but still remember those days. insidecalled the sword and kilt.brings back teenage memories,use to walk in store and spray all the polo cologne i could spray!!!! I grewe up in Petersburg and left in 1983 when the mall was still open and strong. I too spent many a day in Aladdins castle which had to be the coolest arcade around. I also remember going to the record store alot, I think it was called Gary’s . My Mom and her friends used to go to Thalhimers alot and I remember getting donuts and cakes from the bakery in the middle of the store and those black and white checkerd bags and boxes. There was also a fountain in the center of the mall close to the entrance which looked like it had been built over and used as a small stage or something in its later years. I visited a few times after it closed in the 90’s and it looked like a ghost town. I was back recently in october and saw the new shopping center in its place and it looks just like any other shopping place now. Somewhat lost it;s charm. I would be interested to see more pictures of this mall if anyone has them. Too bad we didn’t have digital cameras in those days; i’m sure we would have lots of pics to look back at. So glad to have come across this page. I was looking for pictures of the America House at the Best Western in Petersburg. I grew up in Petersburg. Did the Mall Walk many, many times growing up. I remember when you could not walk through that Mall on a Saturday – so many people, and lots of kids just walking from one end to the other all day long. I worked at Thalhimers from 1976 until the store closed. It was a great place to work. And this Mall was the place to go during its hey-day. Everyone who used to go there will to this day remember the bakery at Thalhimers, that chocolate cake was unbelievable. That store meant a lot to a lot of people. It’s where I met my closest friends. The friends I still cherish today. When I started there Mrs. Rose was the Manager and a true lady. The fish store was the Family Fish house. They had all you can eat before it was popular and brought everything in these little brown bowls. The big thing was to see how high you could get those stacked up. Peoples Drug Store became CVS. They had a lunch counter. It was great for the people who worked in the mall and the kids who “patrolled” it. The Sears across the street in the Plaza – the one with the key kiosk in the middle of the parking lot – well that kiosk used to be where WSSV would broadcast out of – an AM station – with a Friday night dedication line that no one today would understand. This was fun – thanks. Lots of good memories. @Tina, I worked at JC Penny in 1976. WSSV, that was the station to listen to in the 60s and early 70s. I remember the Sears in the plaza always seemed so cold during the summers. Thanks for the memories. I have fond memories of Walnut Mall. I spent many wonderful times there back in the late 70s and early 80s. We got our school clothes(jeans and screenprinted t-shirts) from Jean Shack. It was a great store. We bought music at Gary’s. I remember getting a shiny new Sony Walkman out of the small electronics department at Thalhimers. Spent many hours in Aladdin’s Castle playing Tron and Punchout. Wonderful memories! I worked at the Walnut Mall from 1988-1989. I worked at Gary’s Hallmark, and sometimes filled in at Gary’s Records (both were owned by the same guy — Gary, I presume). I remember going on an interview for the Hallmark store in the back of the room — it took maybe ten minutes. The manager was Maggie and she was the sweetest lady. I remember her telling me she had saved up all year to buy her grandson a Nintendo set, which was the latest greatest in gaming technology at the time. I drove from Colonial Heights and remember the new mall being built, which definitely helped Walnut in its decline. I remember the Walnut becoming a bit scary during this time, particularly on weekends when it would be packed wall-to-wall with people, but not many would actually be buying stuff. Mainly loud kids hanging out and harassing shoppers from time to time. But overall, good memories and an interesting place to work. Wow! That brought back memories to one who grew up in EWH. I’m glad they are doings something with the land there, it was so sad looking when everything closed and weeds overtook the parking lot. I look forward to going there in August when we travel up to Petersburg (from Conway, SC)!! I bought my wedding cake from Thalhimers and me and my BFF Dee-Dee would go there to get cupcakes!!! They had the most tempting bakery! I bought my classring from Morton’s jewelers. It was good to see a little bit of my hometown! My Grandmother moved to Petersburg in 1970 when my aunt was 13… When I was a kid we went to the peoples drug and Thalhimers all the time… I remember my aunt going to the Ultima 2 counter… The mall and Walnut Hill plaza could have been so retro fun… I know towards the very early 90s that area looked pretty bad… I was glad to run past this site it brought back alot of happy forgotten memories! Anybody remember those turtles kids could climb on? I SO remember playing on them as a child. And the Halloween Costume pageant with Bowman Body! AWESOME! @Lynda White, i REMEMBER GOING TO ANNABELLES; IT WAS ANOTHER RESTAURANT BEFORE IT BECAME THAT. (?TUESDAYS OR SOMETHING LIKE THAT I THINK) I LIKED SITTING UP STAIRS. ALSO REMEMBER GOING TO DENNY’S STEAK HOUSE; WHICH WAS ON S CRATER ROAD, ON THE OPPOSITE SIDE OF THE ROAD. I DON’T KNOW IF THE BARN IS STILL THERE OR NOT. I grew up on Jackson Court in the early to late 60s so I remember when the mall was being built. Basically that was all swamp. Across from the mall was Fort Hell, which later became a J M Fields then later Grants. Thalhiemers was a high end clothing store and I had many friends in High School that worked there. The mall was quite the place. I was awed by the fountain and palm trees. During Christmas it was packed. Later I worked at the JC Penny’s in 1975-76. That was the mall’s heyday. I WENT THERE AS A CHILD IN THE 60S AND TEENAGER IN THE 70S. LOVED THIS PLACE! WE WOULD ALSO GO TO THE WALNUT HILL THEATER WHERE THE ELDERLY WOMAN AT THE TICKET WINDOW WOULD MAKE YOU SHOW YOUR ID TO SEE AN “R” RATED MOVIE. I REMEMBER THE FOLLOWING STORES AT THE MALL: BRESSLER’S ICE CREAM SHOP; MORTON’S JEWELERS; RUCKERS CLOTHING; FLAIR, SO-FRO FABRICS; PEOPLES DRUG STORE; THALHIMERS; TIFFANY’S, THOM MCANN SHOES; STRIDE RITE SHOE STORE; J C PENNEY’S, A CAFETERIA WHICH LATER BECAME A SEAFOOD RESTAURANT; AND A SMALL STORE ON ONE OF THE CORNERS; DON’T REMEMBER THE NAME. I remember going there as a kid. My mother grew up in petersburg in kenilsworth. I believe at halloween there was a man with a chainsaw in the mall. Does anyone else remember this?